I have had work booked in for the Christmas to New year period since November so I am still working….which I hope you are not. A lot of my customers used to live in Cairns but now live in other parts of Australia. Many still have family in Cairns and fly home for the holidays and book in jobs with me while they are home. This period has been pretty much booked full since November this year. I did manage however to get a bit of work done for my wife this year. Over 20 years ago I made a bracelet for her. It has lasted a longtime despite her wearing it everyday. The time had come to remake it. Over time the links wear each other down. To lengthen the life of the bracelet she always takes it off when she comes home. She does not need to have it on at home and in a desire to have it looking as good as possible takes it off. Less wearing = less wear on the links = longer life. I wrote about the wearing out of links caused by friction in this article recently. For a design like this I hand made each one of the links. With a more complicated or fine link design this is usually too time intensive to make by hand. 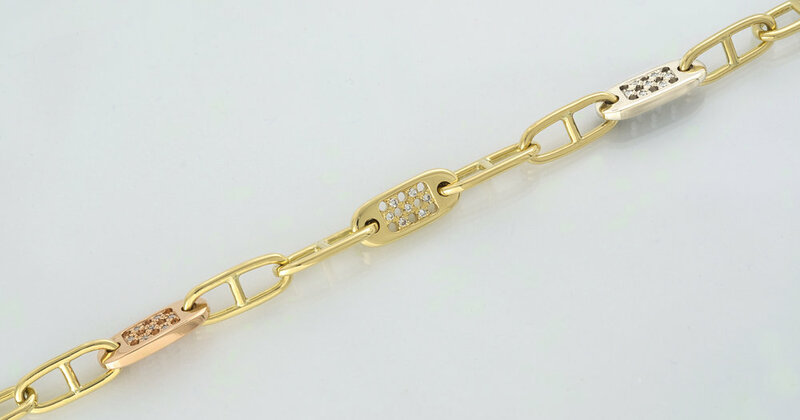 My wife`s original bracelet had one yellow gold diamond set honeycomb link. She had always wanted me to make two more, one in rose gold and the other in white gold. This Christmas she got her wish.